About Colin Campbell (Chemicals) Pty. 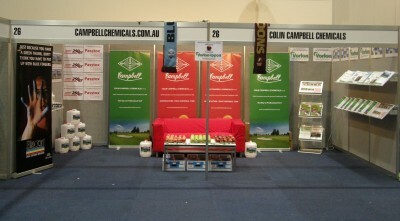 Ltd.
Colin Campbell (Chemicals) Pty Ltd is an Australian company that has been in existence for over 65 years. We have been supplying high quality crop protection products and post harvest treatments to Australian horticulture and recreational turf for over 40 years. Our products provide solutions to all orchard fruit, vegetables, grapevines and recreational turf. We also supply Australia's home garden market with a few niche products. We are currently advancing on many research and development projects for the horticulture market and we look forward to releasing some new and exciting formulations as well as expanding the use of exisiting products in the near future. In the meantime please browse through our new web site, download some product labels and MSDS's. If you have any questions please contact us.